We had a perfect morning for the K family’s beach photos on Isle of Palms. The kind of sunrise you don’t mind waking up early for! One of the most common questions we get asked is what to wear for family photos. Whether you choose to wear white and khaki or pastels, what really matters in photos is wearing a big smile! But to make your outfit planning easier today we are sharing a few of our favorite outfit ideas for family photos. Family Beach Photos are timeless and should look as wonderful in 20-years as they look today. With that being said or biggest advice for what to wear for family photos is to stick to all light colors or all dark colors so that your group looks consistent. If you chose pastels then make sure everyone is wearing light colors. If you go with navy or a darker color then everyone has to wear darker colors. There are a few main outfit combinations that most families choose for beach photos. (But that does not mean you have to!) White and blue, white and khaki, and pastel, are the most popular outfit combinations. We are sharing some examples below of different family beach photos so you can visualize what the different outfit combinations look like. Make sure to also check out our “What To Wear” page for even more outfit advice! 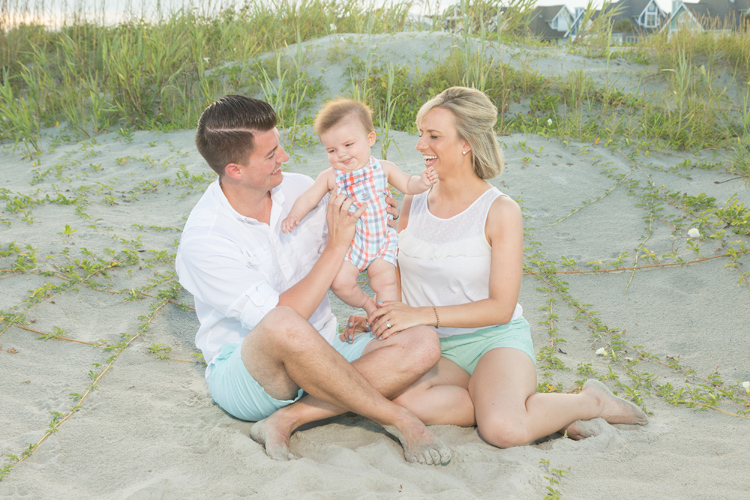 The M family chose a sunrise beach family photo session on Isle of Palms and we had a perfect morning. Just wait until you see the last photo! The sky sure did show off for these family photos on Isle of Palms. 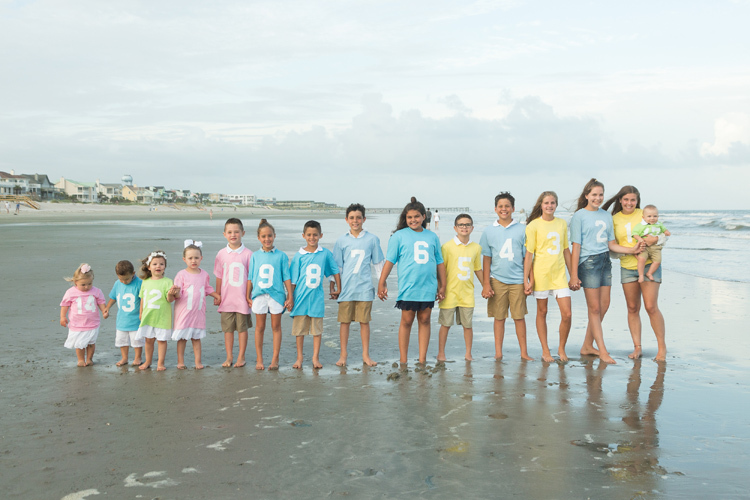 We loved these shirts the K family of 27 had made for their 14 grandchildren! We had a perfect summer evening for the P family beach portraits. How cute is this little Ham? His faces certainly kept us laughing during the R family photo session! The T family opted for a sunrise family photo session on Isle of Palms. We were blessed with a soft sunrise and an empty beach! We had a beautiful evening full of reflective pools for the R family. We had the most gorgeous sunset for the S Family beach portraits on Isle of Palms. 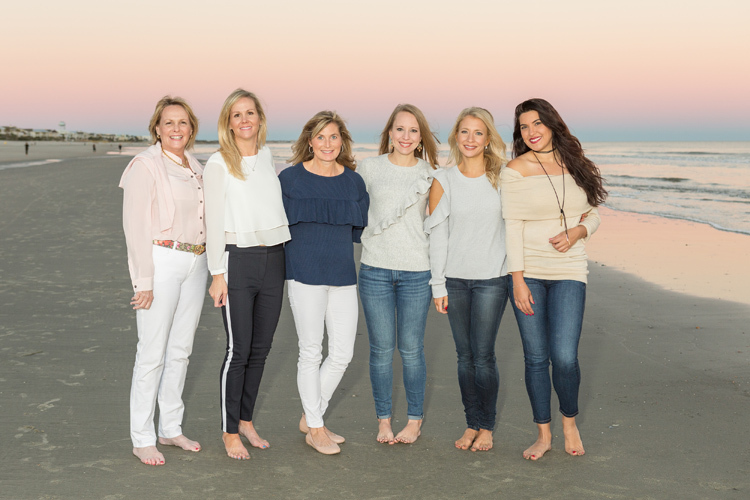 The T family opted for a sunrise family photo session on Isle of Palms. How cute is their littlest member? Today’s featured family didn’t let a little rain spoil their portraits. We waited out the storm and were blessed with gorgeous light for their family photos on Isle of Palms. We took some lovely family portraits of this family in downtown Charleston at the Pineapple Fountain! 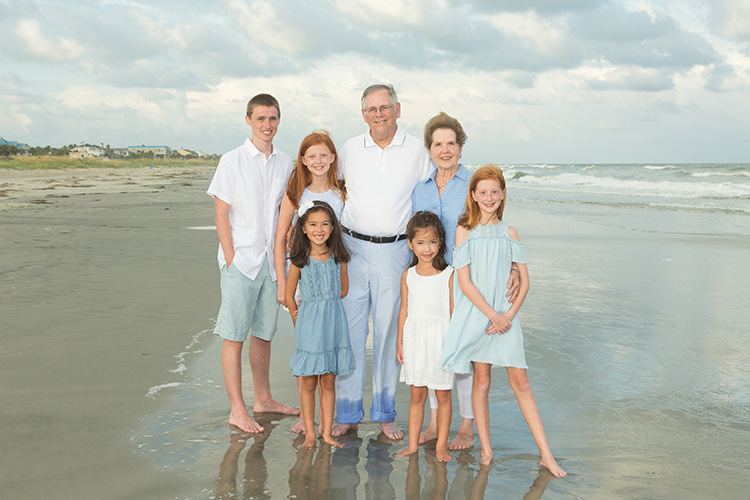 Last year we had the pleasure of photographing the entire Rutherford family on Isle of Palms. This year we were happy to capture two of their children, their partners and a new addition! 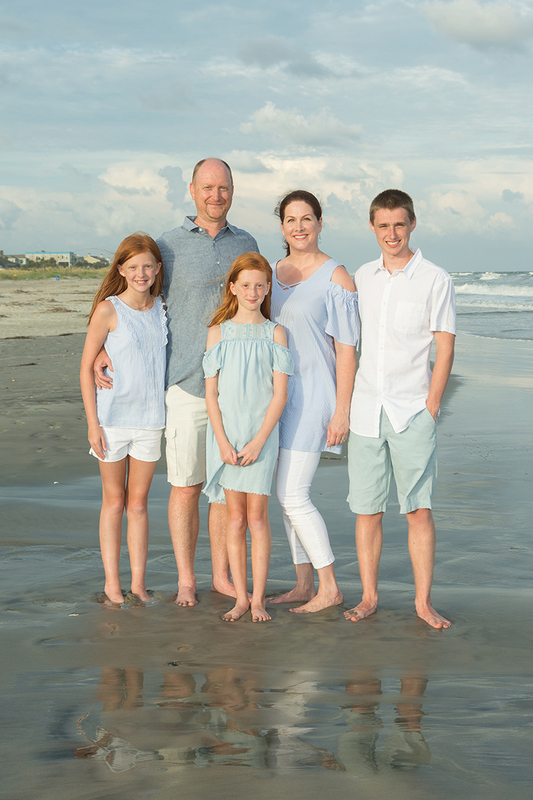 Beautiful multi generational family from Scotland joined us for a beach session in May 2014 on Isle of Palms, South Carolina. All photos by Richard Ellis - Isle of Palms Beach Photography.